Treat Your Feet…and Your Hands! Click if you’d like to actually read the words! 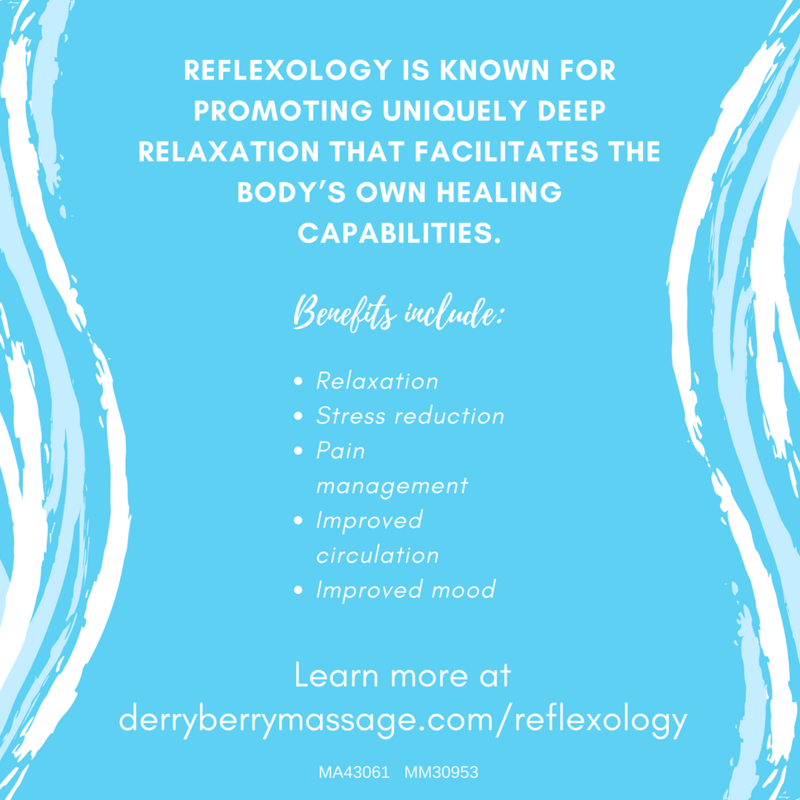 This entry was posted in Reflexology on May 13, 2018 by derryberrymassage. Here’s something important to know: it’s not the same as a massage. As a “distinct complementary practice,” reflexology is separate from massage, with its own origin, history, and techniques. They also differ in intent and focus. The intent of massage is to relax muscle tension by directly working on the soft tissue, whereas reflexology intends to relax the nervous system (thereby indirectly relaxing muscles), and to improve the functioning of internal organs and glands. Medium pressure, take me away! Energetically: Reflexology is thought to break up energy blockages in the body, activating the healing force of the universe, which helps the body return to balance. Pressure-wise, many energy-balancing techniques, like Reiki, do not even touch the body, so light to medium pressure in reflexology will likely be quite effective. TLC: Compassionate physical contact offered by the practitioner is thought to help initiate the body’s healing response. Rest/Awareness: A reflexology session might be someone’s only respite from an otherwise hectic day. The rest, repair, and awareness gained from tapping into the body’s parasympathetic nervous system (the opposite of “fight or flight” mode) can be catalysts for change to occur. Reflexology is almost magical at inducing relaxation. I’ve had so many reflexology recipients say they’ve never felt so relaxed so quickly. Reflex Action: If I touch a hot stove, a message gets sent from my hand/fingers to the brain, which then sends a message back saying “OW—move your hand! !” It does not say “Yes, keep doing that—you’ll actually feel better!” The reflex arc is what we’re dealing with in reflexology—the theory is that there are reflex areas in the feet and hands which relate to different parts of the body. When we make contact through reflexology, the brain sends a signal through neural pathways to the related organ/gland/muscle. We don’t have to pound on it for it to get the idea. In 1932 Sir Charles Sherrington and Edgar Adrian earned the Nobel Prize for work on the physiology of the nervous system, proving that the whole nervous system adjusts to a single stimulus in an effort to coordinate the activities of the organism, which he termed the proprioceptive system. For instance, when a step is taken, the foot and leg move, but so does the rest of the body, adjusting to keep everything upright. Adrian made the discovery that the intensity of the nerve impulse is dependent on the size of the nerve, not on the strength of the stimulus. This suggests that deep pressure is not necessary in reflexology, as it is the contact that is important. Disclaimer: The following is what I believe—you might feel completely different, and that’s ok! Reflexology does not need to be painful to be effective. 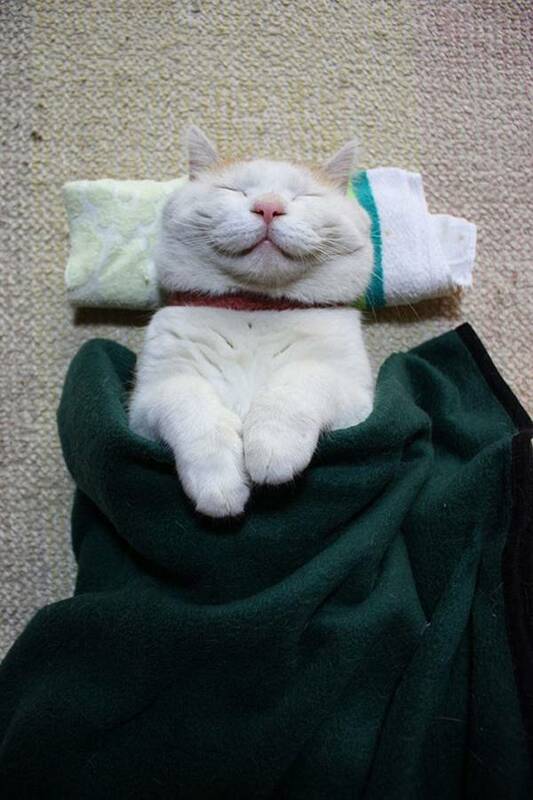 It is a stress-reducing modality at its heart and the goal is to relax. Of course, different schools and practitioners have different styles and focus. My school, the Academy of Ancient Reflexology, follows the approach that we slowly and thoroughly travel the whole foot with our thumb and finger walking, giving time for reflexologist and client alike to be aware and notice changes and sensitivities in the tissues. We’re working to support the body’s health, not to diagnose or treat/fix issues. Pressure is a matter of preference—for both the client and therapist. I have found working at a medium pressure, where it’s deep enough to notice sensitive spots (where I will pause and give extra time for change to occur) but not so deep so as to cause pain throughout is most effective. Pain creates more pain, which makes it difficult to relax. As with many things in life, a little research before booking an appointment is a good idea—ask about the practitioner’s education, what she thinks her pressure is like, what she believes, etc. During the treatment, make sure you speak up if you need more or less pressure. If you come in for a reflexology session wanting very deep pressure and/or pain, I’m probably not the right practitioner for you. I will listen to what you need and try my best to accommodate, but I must also do what feels right to me. The first step to getting the most out of your reflexology appointment is be open-minded and see how it works for you, now that you know what the intent is—to relax and let the body return itself to optimum health! 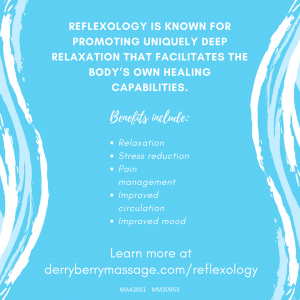 This entry was posted in Reflexology on October 29, 2017 by derryberrymassage.